1. SAME DAY HOT WATER: We can help with all of your water heater needs today. 2. FAST REPAIRS: If your water heater is faulty or leaking, Precision can help with a rapid response to repair your system today. We can repair ALL BRANDS and ALL MODELS of water heater. 3. SAVE ON NEW WATER HEATERS: If it's a new replacement water heater you're looking for, Precision can help with friendly advice on choosing the ideal system for your home, lifestyle and budget. Best of all we can perform a complete installation and even take your old water heater away for a comprehensive hot water service. Just one call does it all! 4. WATER HEATER PROFESSIONALS: Precision Plumbing is fully licensed and licensed for all your plumbing needs. As the the trusted choice in tens of thousands of Colorado homes for their hot water needs over 30 years, you can be sure of expert help and workmanship. 5. ENERGY SAVINGS: Lower your energy expenditure by choosing a newer, more energy efficient hot water solution. Precision can even help with the latest hot water technology, including tankless water heaters. 6. LEADING FEATURES: Precision Plumbing can help show you the new water heaters with the leading features, including the best energy efficiency and 'recovery times' (the time it takes the system to heat a full tank). 7. GREAT WARRANTIES: Benefit from excellent warranties on your new water heater, with extended warranties of up to 12 years available. 8. WATER HEATER SERVICE: Protect your water heater's efficiency and working life with on-going preventative maintenance. Properly maintaining your system with regular service intervals can help protect against rust and faulty safety valves. 9. UP-FRONT PRICING: Benefit from our up-front pricing, as well as our discounts and promotions. 10. FRIENDLY AND HELPFUL EXPERTS: Precision Plumbing will take the time to help answer your queries and show your hot water options. Our technicians are clean-cut, polite, friendly and will keep your home or business tidy. For great service for all your water heater needs across the Denver and Boulder areas, call and speak with Precision Plumbing today. 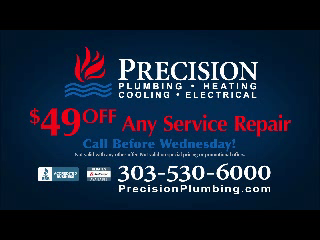 Precision Plumbing, Heating, Cooling and Electric is the trusted home services contractor in tens of thousands of homes across Boulder, Denver, and surrounding Colorado towns and suburbs. Whether it's a Boulder plumber, or heating repairs, or drain cleaning you need - whatever your needs our technicians are available to assist. We offer a comprehensive array of plumbing, Boulder HVAC, and electrical service. 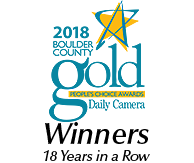 We are local Chamber of Commerce members, and have been selected as the top contractors for service by the Daily Camera for 11 years in a row.